Russia is a nation whose history is wrought with violence. Whether it be the KGB or the October Revolution, Russian governments and citizens have often reacted in incendiary ways. Since the rise of Russian President Vladimir Putin, the government has cracked down on dissent in a conventional and methodical way, arresting protestors and silencing opposition. This lockstep approach to censorship wavered this week. In an huge departure from the norm of the Kremlin, President Putin’s former bodyguard and head of the Russian National Guard, Viktor Zolotov challenged Russian opposition leader Alexi Navalny to a “duel” on state media, through a video posted to the Russian National Guard’s Youtube page. It is likely that the video, which has garnered 152,000 dislikes on Youtube, is in response to Navalny’s expose of grafting within the Russian National Guard. He claims that the National Guard gave substandard rations to its soldiers, marking up the price on quality goods by as much as 300 percent. Navalny argues that the increases to the National Guard budget are used to pay Russian and Ukranian oligarchs who have vastly inflated the price of rations. The National Guard, which is responsible for keeping the peace domestically, is paid for by Russian taxes. Pro-Putin politicians have reviled Navalny for years. He has run for varying political offices, including Mayor of Moscow, but has been defeated each time by a member of President Putin’s inner circle. Navalny made an attempt at the 2018 Presidential election, but was barred from doing so by Russian election officials. Navalny, who is the head of the Russia of the Future Party and ran on a platform based on anti-corruption positions, could not respond to the attacks. He has been imprisoned since last week for leading protests in January, in a move many see as a way to silence the opposition leader ahead of pension protests that were slated for September 9. The move is risky for the Russians, who have to balance the silencing of opposition with the possibility of uprising. 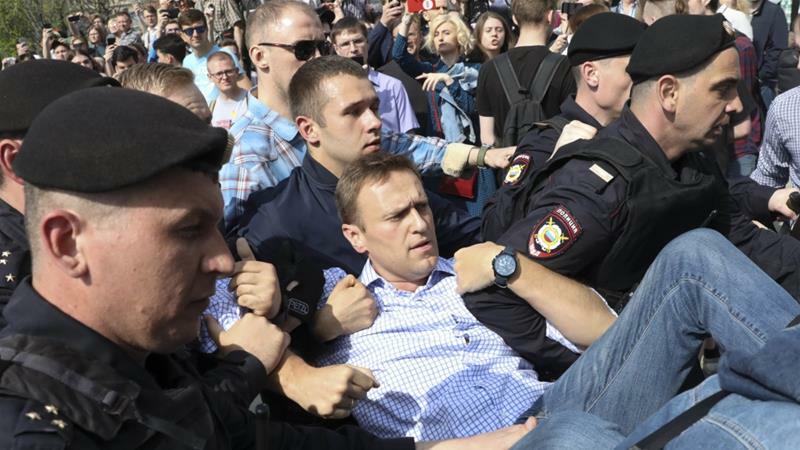 Navalny’s history with trumped-up charges does reduce this risk, however, as it is likely that one more arrest doesn’t tip the scales of public anger. That doesn’t mean the video from Zolotov makes sense, however. Zolotov’s action is unusually public and emotional for a Kremlin whose power lies largely behind the vestiges of the KGB. Clothed in secret, much of Russia’s domestic political policy relies on backdoor deals and old military friends, not public appeals to discredit the opposition. Zolotov’s video in fact lends credence to Navalny’s claims, whereas the smarter political move would have been to simply ignore the argument. Bad publicity is still publicity, and in a country that still grapples with the censorship of the Iron Curtain and exercises political clout to arrest political dissenters, this seems like a serious slip-up. To add to the absurd nature of the political scene, the pro-Putin Liberal Democratic Party put forward a bill codifying a 1912 codebook for duels, replacing the word “noblemen” with “government and municipal officials.” The duels would be allowed with sabers, pistols, and small swords. Much of the Russian public made light of the situation, however, lambasting Zolotov in the process. Many memes have been made about the affair, and critics of the government have taken the opportunity to highlight other hypocrisy within the government. One public figure challenged Zolotov to a mathematics test, stating that “it is obvious that [Zolotov] has serious problems with equations,” highlighting Zolotov’s alleged corruption. Ultimately, it appears that despite the eyebrow-raising actions with official Russian PR channels, nothing is likely to change. Navalny still lies in jail and despite a few good-humored jokes at the expense of corrupt officials, the grafting is unlikely to stop.